MasterCraft Boat Holdings Expands Portfolio with Aviara | MasterCraft Boat Holdings, Inc.
VONORE, Tenn., Feb. 05, 2019 (GLOBE NEWSWIRE) -- MasterCraft Boat Holdings, Inc. (NASDAQ: MCFT) expands into the day boat category with today’s announcement of its newest brand, Aviara. Following a calculated study of the market and successful collaboration between the company’s executive leadership, engineering, manufacturing and brand building teams, Aviara was uniquely conceived in-house to offer a totally new luxury recreational day boat experience. Focused on the production of vessels 30-feet and over, Aviara enters the market with the launch of its first model, the AV32, at the 2019 Miami International Boat Show in February. The new AV32 recreational day boat from Aviara. Aviara creates an elevated open water experience by fusing progressive style and effortless comfort in each and every modern, luxury vessel. Aviara’s aesthetic exudes European styling and delivers unmatched levels of craftsmanship and feel for customers that demand perfection. Born from a team with decades of innovation excellence, Aviara performs with unrivaled precision, enabling captains to instantly master every escape. On an Aviara, captains become hosts and entertainment is top priority. Aviara designers have re-imagined the luxury day boat experience, creating an open deck layout with modern comfort that prioritizes social interaction. Aviara delivers premium standard features and appointments, and elevated control beginning at the clean, digital-forward helm and carried through to the premium audio that enhances the on-board experience. 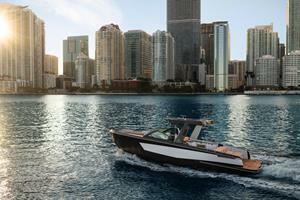 Aviara’s are available in both sterndrive and outboard propulsion options. The company’s vetted vendor relationships and exclusive partnerships with leading companies factor into the premium design, innovation and quality in every boat. From premium materials to Ilmor Marine sterndrive powerplants, Mercury outboards and Klipsch audio, owners enjoy a unique, luxury experience where details matter. Aviara is American made in MasterCraft Boat Holdings’ world-class manufacturing facility in Vonore, Tenn. Aviara will be handmade in the same facility and receive the same dedication towards manufacturing precision and unrivaled quality that is applied to the company’s flagship MasterCraft brand. Orders for Aviara will begin on February 14. For more information about Aviara, please visit www.aviaraboats.com. MasterCraft Boat Holdings will unveil Aviara’s AV32 at the Miami International Boat Show at an open house event on Thursday, February 14 at 3:30pm at Pier 8, slips 828 & 830. About MasterCraft Boat Holdings, Inc.
Headquartered in Vonore, Tenn., MasterCraft Boat Holdings, Inc. (NASDAQ: MCFT) is a leading innovator, designer, manufacturer and marketer of premium recreational powerboats through its four wholly-owned brands, MasterCraft, NauticStar, Crest and Aviara Boats. Through these four premium brands, MasterCraft Boat Holdings has leading market share positions in three of the fastest growing segments of the powerboat industry – performance sport boats, outboard saltwater fishing, pontoon boats - while entering the large, growing luxury day boat segment. For more information about MasterCraft Boat Holdings, please visit: Investors.MasterCraft.com, www.MasterCraft.com, www.NauticStarBoats.com, www.CrestPontoonBoats.com, and www.AviaraBoats.com. Source: MasterCraft Boat Holdings, Inc.